I wanted to learn more about sweet potatoes so I visited North Carolina, where almost 50 percent of the sweet potatoes produced in the United States are grown. My first stop was the North Carolina Sweet Potato Commission. 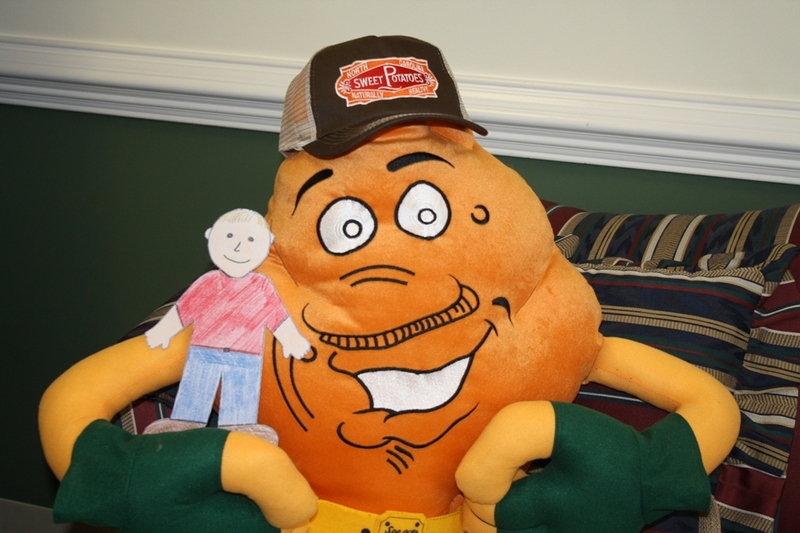 Here’s a picture of me with my new friend, Spencer Sweet Potato. He told me all about sweet potatoes. I learned that a class of fourth graders started a campaign, sending letters to the state legislature asking that sweet potatoes be named the state vegetable of North Carolina. It took two years and lots of letters but in 1995 the legislature named sweet potatoes the official state vegetable. Spencer also told me that yams and sweet potatoes are not the same thing. They are both the root of the plant, but true yams are starchy roots imported from the Caribbean and Africa. The “yams” we grow, sell and buy in the United States are really sweet potatoes. After talking with Spencer I was excited to visit a farm. Brooks and Heather Barnes have grown sweet potatoes for five years and were happy to show me around. Sweet potatoes are planted in the spring but you don’t plant a seed. When they were planted in May these vines were the size of the farmers finger. Now they cover the field! Can you find me? Did you know sweet potatoes grow underground? They are the root of the plant. The farmer uses a tractor with a special plow to dig the sweet potatoes. The plow flips the sweet potatoes so instead of being underground, they are laying on top. Brooks let me ride in the tractor with him while he plowed a field. Sweet potatoes have a thin skin which can be damaged if they are harvested by a machine. 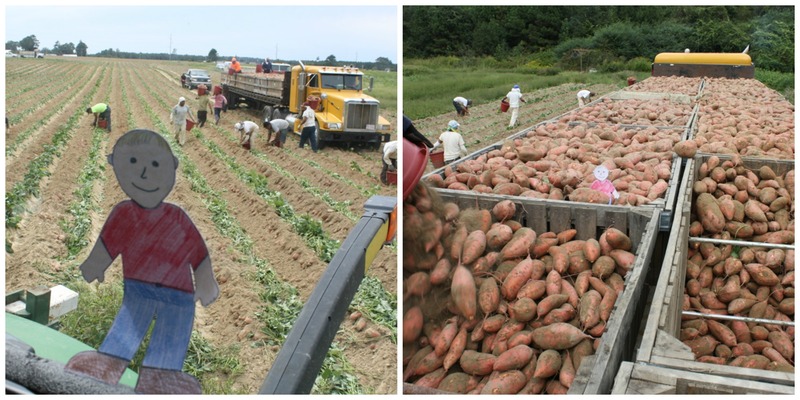 This is why most sweet potatoes are harvested by hand. 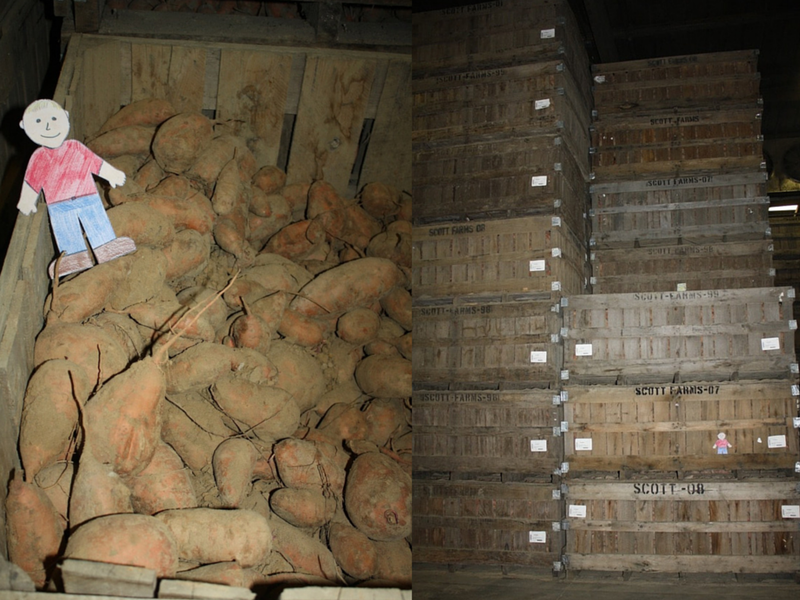 The sweet potatoes are separated by size in the field and then put into wooden boxes. Each box holds 40 bushels or 2200 pounds. After we were finished in the field, Heather took me to Scott Farms to show me how sweet potatoes are cured and packed. After sweet potatoes are harvested most are cured right away. No, the sweet potatoes aren’t sick. Curing is a process that tightens the skin and changes, or converts, some starch to sugar so the sweet potatoes are sweeter. Farmers cure sweet potatoes in big buildings. They are kept in the wooden boxes and aren’t washed first. The temperature and humidity have to be just right or the sweet potatoes won’t cure. After 4-7 days the curing process is finished. The farmer will change the temperature and humidity in the room, keeping the sweet potatoes at the right temperature until they are packed. Sweet potatoes can be stored for over a year and will still taste good. This means I can buy North Carolina sweet potatoes all year long! 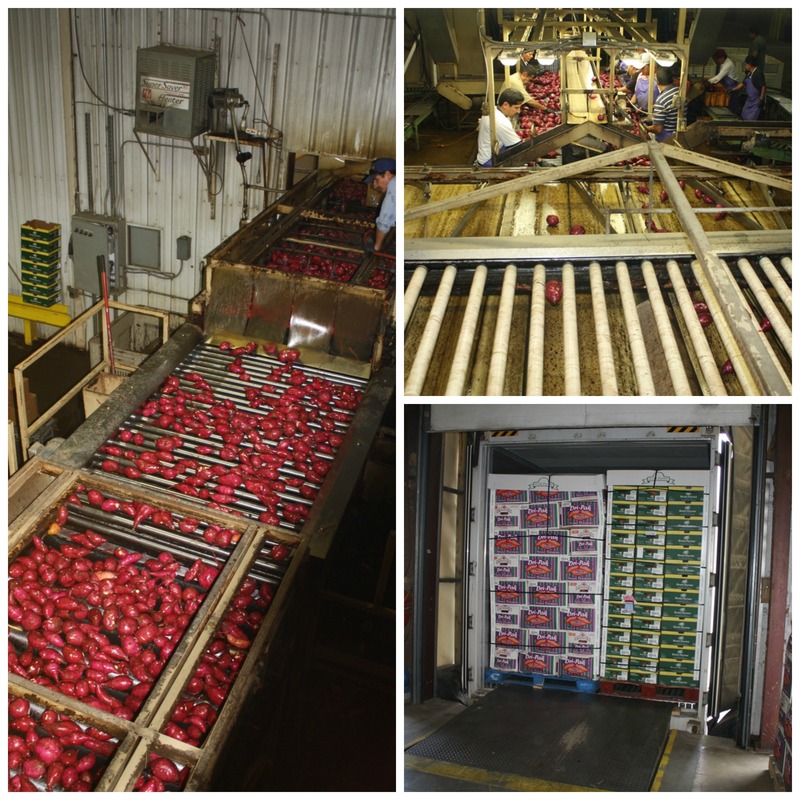 When the farmer is ready to pack sweet potatoes for market, he pulls the boxes and runs the vegetables through a packing line. It starts with a wash tank, where all the dirt is washed off. Then the sweet potatoes move through a line where they are graded and separated by size before being packed in a 40 pound box. The boxes are shipped to grocery stores, restaurants, schools and even to other countries like England and Germany. The day I visited, Scott Farms was packing Murasaki sweet potatoes, which have white flesh and purple skin. I learned there are different varieties with different colors. Covington is the most popular variety and has a bright orange flesh with rose skin. There is even a variety of sweet potato with purple flesh and purple skin called Stokes Purple. Did you know sweet potatoes are an ingredient in dog food? 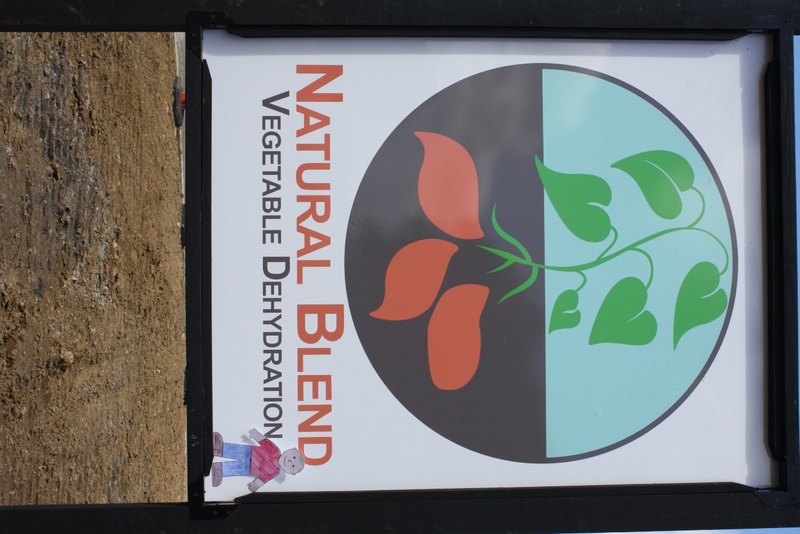 I didn’t either until I went with Heather to the ribbon cutting for the Natural Blend Vegetable Dehydration plant. A ribbon cutting is held when a company is opening for business. This company is owned by another sweet potato farm, Ham Produce. The plant will take sweet potatoes that can’t be used for other things and dehydrate, or dry them, so they can be used to make dog food. I spent my last weekend in North Carolina at the Wide Open Bluegrass Festival. 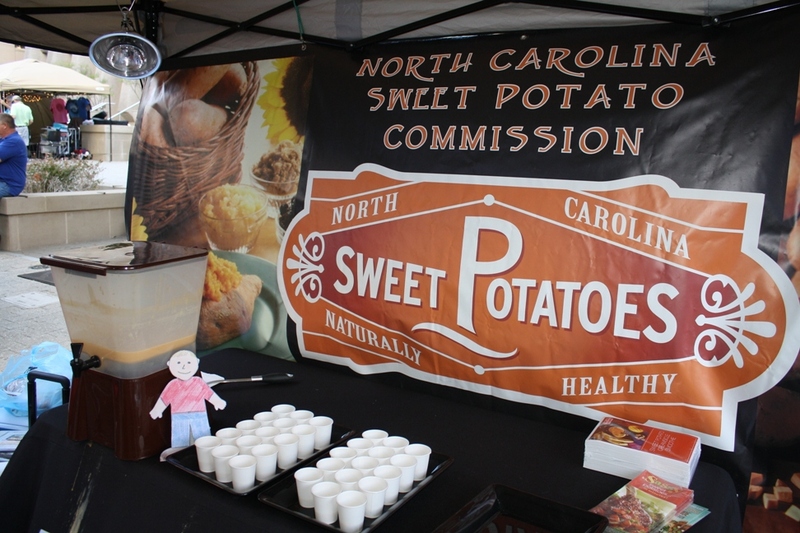 The NC Sweet Potato Commission had a booth promoting all the different ways you can use sweet potatoes. I knew you could bake them or use sweet potatoes in casseroles or pies but I found out there are many yummy ways to cook them. On Friday night we gave away samples of Chocolate Chip Sweet Potato muffins and on Saturday I helped serve Sweet Potato Creamsicle Smoothies. We talked to lots of people who love sweet potatoes and now I do too! 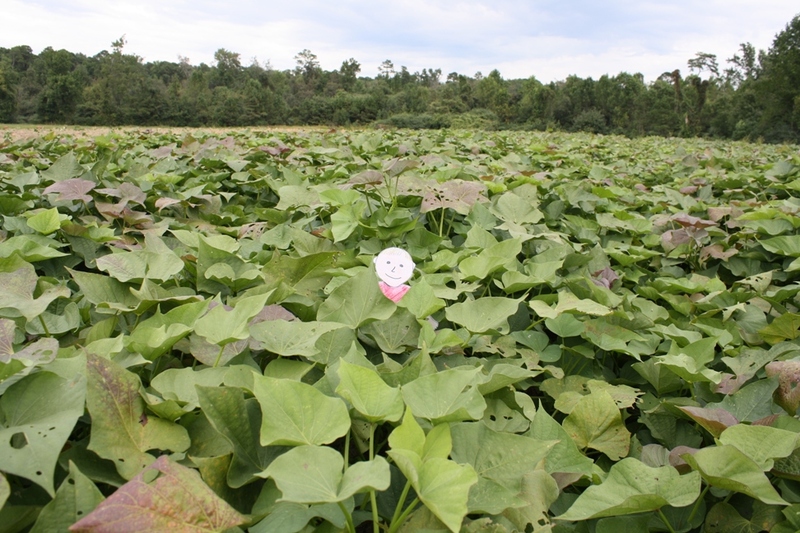 This entry was posted in Ag in the Classroom and tagged Flat Aggie, North Carolina, sweet potatoes. Bookmark the permalink.